The Summit Farmers Market is back for its 23rd year! 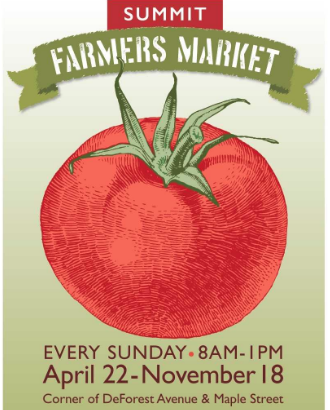 The market will be open 8am-1pm every Sunday, April 22-November 18. Visit the market to purchase high quality, locally grown and produced cheese, pickles, baked goods, honey, produce, bread, pasta, soap, wool, and more. Come early and stay late to enjoy all the market has to offer! For more details, visit summitfarmersmarket.com. Every Sunday starting April 22, 2018, until November 18, 2018, from 8 am - 1 pm.